An avid dancer and Seattle Seahawks fan, Tony Miles brought his infectious enthusiasm all the way from Jacksonville, Florida. He's been playing tournaments since August 2011 and had two modest scores this summer in The Colossus (for $2,358) and the Millionaire Maker (for $4,038). His career tournaments earnings will change dramatically now that Miles is guaranteed at least $1,000,000 for making the final table, which he'll enter with the third-biggest stack. Indeed, Miles had little reason to be worried. 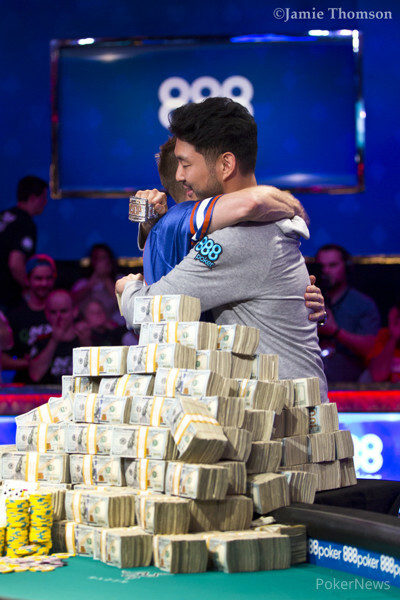 He consistently built his stack during the tournament and, along the way, has had a supportive rail that cheered him on. Miles's rail closely watched the action on the outer tables. When Miles sat down in the Thunderdome, you'd better believe that they made a ruckus. 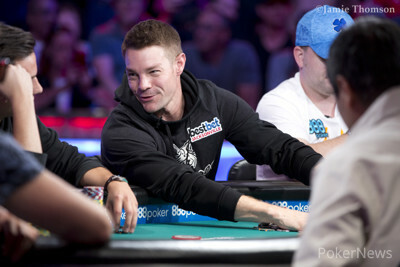 Coming into the unofficial final table last in chips, Miles never lost his composure and doubled up twice. “There was never a rush," he said. "I take one hand at a time and do my best to stay at an elite level. I think that this final table is one of the toughest final tables that has ever been composed. There are a ton of sickos. It's going to be really competitive and really fun to watch." On Day 4, Miles competed on the ESPN Feature Table alongside David Kitai, a Belgian pro and a tough competitor. Kitai raised to 35,000 under the gun. Miles three-bet to 115,000, Kitai shoved all-in for about 350,000, and Miles snap-called with two aces. Kitai's two queens couldn't catch up, and the bracelet winner from Belgium was eliminated. In the meantime, Miles bagged Day 4 with 2.358,000 in chips and kept up the pace all the way to the final table. The plan for tonight and tomorrow, Miles said, is to sleep well, meditate, eat healthy, and come to Day 8 focused and ready to execute. In previous days, Miles has been sporting a Seattle Seahawks jersey. There may be a wardrobe surprise in store for the final table.